Mrs Watson accepts a donation on behalf of Marie Curie. 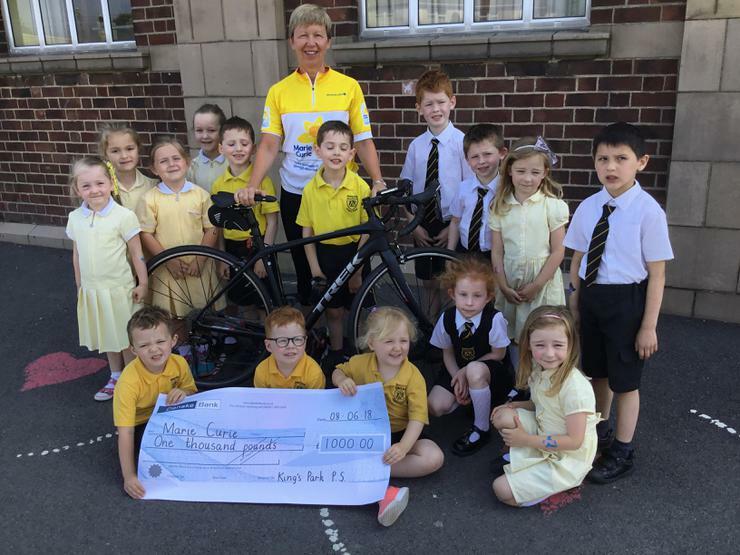 In July Mrs Watson will cycle from London to Paris for Marie Curie and we wish her all the best with this endeavour! Included in the photo are: P1: Bella and Lucia McMullan, Sadie Moorehead, Rebecca Graham, Raef and Caeden Cousins, Amber Glenn and Lily Patterson. P2: Zack Stewart, Issac and Grace Neville and Luke Benitez Lopez. Nursery: Luke Hunter, Emily Rose Matchett and Harry Uprichard.